Oceanfront Condo is uniquely perched overlooking the beautiful Pacific Ocean and just 5 minutes from the airport. 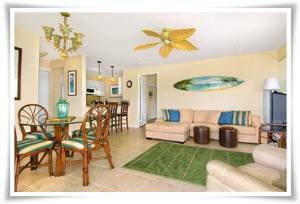 This condo offers couples a great honeymoon location or is ideally set up for 2 adults only. You will enjoy easy access to the beach for swimming or the white sand beach stretches for miles & invites you for a relaxing walk. Staying at this Condo keeps you close to Golf, Shopping, Dining & activities. Views don't get any better than this. The Air-conditioned bedroom includes King size bed, cable TV, DSL and separate phone. 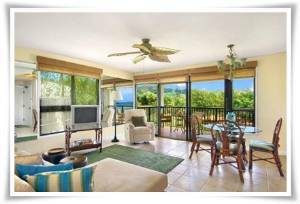 This favorite Kauai Condo has been completely remodeled with all the designer touches. Custom artwork, ceramic 16" tile, granite countertops & furnishings makes this Oceanfront Condo a 5 star room with 5 star view. Watch sunrise come up over the Pacific Ocean from lanai. In the evening, watch the twinkling lights of Kapaa & Wailua Bay. Wailua Golf Course is adjacent to the Condo. Kauai Beach Villas is located on luxuriously landscaped 25 acres with shimmering ponds and tranquil lagoons which are graced with swans and exotic birds. We are centrally located between lush North Shore and Waimea Canyon to the west. Wow! The views from the lanai, and the miles of unspoiled, uncrowded beach and tidepools were amazing! We found it very swimmable, despite some posts to the contrary. We thoroughly enjoyed our stay. Appreciated the extras like the ice box, beach towels, laundry soap, and olive oil! Thanks! Easy check-in, great location near airport and town, yet felt quiet and away from it all. Downsides were the door was VERY hard to unlock, and a constant humming sound from some sort of (fan maybe?) on the roof that ran 24-7. Overall, would definitely return! Homeowner Response: It turned out there was an attic fan which had a bad belt. It was replaced and there is no longer any noise. We had a wonderful stay at the Kauai Beach Resort (G6). Accommodations were very good. Employee assistance was excellent. Nice pool area, long beach to walk along, excellent location to get to all areas of the island and overall a place we would stay again. In summary: As much fun as it was to get out on the day's activities, it was at least as much fun to come "home" to Kauai Beach Villa G6 ! We loved sitting with a glass of wine on the lanai and listening to the ocean and watching the birds......even the chickens. The condo is very clean and extremely well-organized. Love the washer/dryer and diswasher, not to mention beach towels! Thanks for sharing your place with us! March 4, 2013 Reviewer: Anonymous From: Rouleau sask. love the area and the unit feels like coming home. What a fabulous place to stay. Clean and well kept with a killer view. Steps from the beach and central to all Kauai destinations. The grounds are beautiful and include restaurants and pools. The owners were great to work with as well as the management company. Note to those with mobility issues, it is on the third floor and there is no elevator. We could not have asked for a better stay and we will be back! Nicely decorated (like pictures)and very clean condo. Stunningly beautiful ocean and land view from the lanai. 3rd floor great for leaving lanai screen door open and allowing the trade wind breezes cool condo. Don't need to use AC in bedroom then. Nice to be able to use the Hotel (Aqua)facilites (pool, chairs, etc) next door too. Great 2 person condo. We stayed here for 28 days. ALL IN ALL A great place to stay!!!! Few suggestions for updates - new(er) linens - beds and towels. CD Stereo did not play CD's (but Chuck was replacing this). That stereo was really just an AM/FM/CD player clock radio. Better sound system would be nice. Also, small TV in Living room has very poor sound (small speakers). On lanai suggest having a larger table (so 2 can eat meals out) versus the one small patio end table. Homeowner Response: Cd player has been replaced and we added a iPod/iPhone dock. All new linens were purchased after this gust departure. bonus of an oceanfront view, then this is the spot! We truly enjoyed our stay at Kauai Beach Villas, unit G6. The condo was spacious, clean, and quiet. The view of the ocean was fantastic, and the central location made for convenient jaunts to various parts of the island. All of the appliances were clean and in working order. We also enjoyed access to the pool at the resort next door. The owner was easy to deal with--no hassles; the key to the condo is left at the car rental place, and the damage deposit was returned promptly. All in all, our stay at G6 helped to make a great vacation even better. Would definitely stay here again! We had a great 2-week stay at Kauai Beach Villas - G6 - right on the beach. The place was immaculate when we arrived and very well equipped for a comfortable stay - all the comforts of home! Great pool and BBQ within close walking for added enjoyment. The resort grounds are well looked after too. Shopping is close by in Lihue or Kapa'a. We would definitely stay here again! Easy to book and the owner was very helpful in advance by e-mailing us with tips and a link to his own travel log. Ditto for the rental agency. Couldn't have been happier! Thanks!! was easy and everyone was very friendly and helpful. Kauai Beach Villas G-6 was a very nice place from which to stage our Kauai explorations. Easy access North and South was great. The interior of the condo was very comfortable and clean. The beach access was also very nice. We loved it! My wife and I stayed in KBV -G6 in December 2010.The unit was very comfortable and the view was great! We would also like to mention what a pleasure it has been to work with the owner! December 13, 2010 Reviewer: Hali and Henry From: Baltimore, Md. We had a beautiful vacation in this one bedroom condo with a stunning view of the ocean and the mountain. The porch was such a bonus to read, relax and eat. The setup was perfect for our needs. I walked down every morning to watch the sunrise by the beach. the location of the condo was ocnvenient to all sides of the island. I spent two weeks at Kauai Beach Villas G6 and had the best time ever. The condo was beautiful with a great beachfront view of the ocean. 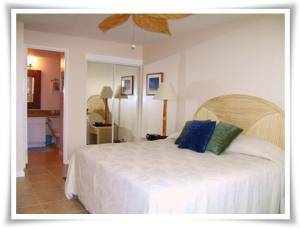 It was comfortable, modern, and centrally located to shopping and tourist attractions. We're thinking of returning after the first of the year! For our first trip to Kauai this place was amazing. The pictures do not lie. Chuck replied within 24 hours to our date request, and the Kauai Beach Rental Agency folks were great. At one time there was a strange beeping noise coming from an adjacent unit, it was fixed within the hour. We enjoyed the island so much we are thinking of a timeshare purchase. It was very easy to rent this unit. The owner Chuck emailed me back right away to confirm that the unit was available and then the rental company, Kauai Vacation Rentals, were very nice and accommodating. They drop a packet where you will be picking up your rental car with keys and a map to find to the unit. We landed at 12:12 pm and were literally at the condo at 1:30. The unit looks like what you see on the website. The interior has been tastefully redone. I think this is unusual compared to the other units in the complex. It was very comfortable and the kitchen was fully stocked with utensils and cookware that you might need. The view is beautiful off the Lanai. My only complaint with our stay is with the location of the condo but I think it may have to do with the time of year. Unfortunately in March and April, this location was very windy and stormy. We had to drive every day to try to find the sun. It seemed like we would find some sun in the north and some in the south, but every time we came back to the condo, it was gale force winds and black rain clouds. It would have been nice to wake up one morning of the eight to blue skies. Because of the strong wind and cool temperatures, we didn't use the lanai at all, nor did we use the pool or beach near the condo. So even though it was picturesque, we unfortunately didn't realize a benefit of staying so close to the sea. On the weekend we did have kids on atvs riding on a dirt course across the little river in front of our unit, but the noise didn't really bother us because we were gone most of the day. I would recommend this unit to others. You have a very comfortable place with all the amenities of home. The decorations and personal touches made it hard to leave. We loved the peace and quite while sitting on the lanai and watching the waves and feeling the lovely ocean breezes. The beach in front of the condo was unbelievable. We began everyday with a walk down the beach. We saw what God sees by way of helicopter and boat trip around the Na Pali Coastline. Conserve and protect your island paradise. We couldn’t imagine a better spot to stay while visiting the Garden Island. Chuck was very helpful with additional tips on where to eat and visit while we were here. The rental agency, Kauai Vacation, was professional and answered all our questions. We HIGHLY RECOMMEND staying at Kauai Beach Villas G6. We wouldn’t consider staying anywhere else on our next visit! The unit was just as pictured and advertised. Clean,well appointed,and the view was excellent. We prefer to stay in the shade,and the balcony was ideal, mostly out of the sun, yet sheltered from the prevailing winds. The property managers were quite professional, dealing with our only minor complaint quickly, and to our entire satisfaction. We recommend this unit to any couple. KBV G-6 Is a great unit - We visit kauai for 8 to 10 weeks a year and have stayed in a dozen or so different condo's. This is definitely one of the top few one BR units. 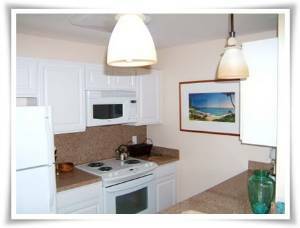 We will stay again - Great location on the beach - great view and nicely furnished unit Aloha!! We stayed in Kauai Beach Villas condo G-6 at the end of August. The condo was beautiful. It looked exactly like the pictures on the website. We will definitely stay here again the next time we are in Kauai! This condo was more than we expected! It was spotless, beautifully decorated and very comfortable. It was tempting to spend our entire holiday lazing on the beach or our private lanai, but the beauties of Kauai called us. The goody bag was a pleasant surprise, as well as the boogie boards and beach mats. It was also nice to be able to use the neighboring Hilton facilities...especially the spa and massage! We've recommended it to all our friends. You won't regret renting this unit for the perfect Hawaii get-away. sunsets. We loved every bit of it. We absolutely enjoyed our stay at Beach Villa G-6. The view was so beautiful. It almost looked like a mirage. It just couldn't be real. We really enjoyed being right on the ocean. And the room was every thing they said it would be. Nice, clean, and beautifully decorated. And Oh,did I mention it has an air conditioner in the bedroom! We loved the location of our place as well. We were not right in town. And the beautiful Wailua falls were nearby as well as the Smith's Botainical Gardens , which was breath taking! And we found that on the East side of Kauai things didn't seem to be as costly as in the other areas of Kauai. We would definitely stay here again, if given the opportunity. The owner was very accomodating as well as the people there at the office. It was almost like having your own private beach to play on , just a few steps away! interest for others to possible visit too. 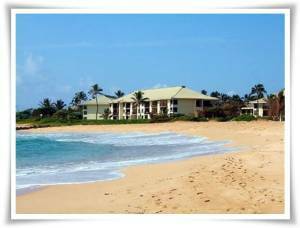 My wife and I stayed in Kauai Beach Villa G-6 May 2-8, 2009 and could not have been more pleased. The condo was beautifully decorated and extremely well furnished. The pictures on the website does not do it justice. It is also has about every amenity you could need. The view is incredible from the lanai. It is easy to get here from the airport and it is centrally located to see the rest of the island. This was our first trip to Hawaii and we wanted to see all Kauai we could. We would highly recommend this condo to anybody who is thinking of visiting here. Also high marks for the owner (great job on the condo and very responsive on email questions) and for the agents at Kauai Vacation Rentals (very helpful and courteous). My fiance` and I stayed in Kauai Beach Villa G-6 April 16-22 2009. It was just what the website showed; clean, modern, and beachy. We loved having our own kitchen, living room, balcony, and washer/dryer. We have never stayed in a condo on vacation before and now I don't think we'll ever go back to a hotel! We really enjoyed our visit. 1- Bring/rent a GPS, even though maps are provided when it's dark and you arrive late the Garmin is so much easier then trying to read a tiny map! 2- The door to G-6 is tricky. There appears to be a lock on it but your key will work and you have to really work on the door to open it (we had to get maintenance & it was very frustrating because we were so tired). 3- Even though the front office is not affiliated with G-6 they are the ones that give you your parking pass for your vehicle. 4- You have to drop your key off at the Property Management office NOT the front office of the condos. This was very frustrating since we did not figure this out until we were leaving to the airport. We had already thrown our maps away, were running late, and no one answered the emergency number we were given. We did find the office (which was out of our way) and later we received a voicemail that we could have left the keys in the condo. Other than these mishaps our vacation was amazing & totally worth it! Homeowner Response: 2. The front door is a hurricane certified door. The door is solid and you just pull on the door handle toward you while turning the lock. Once you remember this, the door is easily openned. I will remind the management company to include this with the check-in instructions.4- Keys are left in the condo at check-out or can be returned to the management office. I’ve just returned from my first visit to Hawaii, and a highlight was the week spent at condo # G-6, Kauai Beach Villas. We found the location ideal, with easy access to shops and restaurants (our favorites were Kintaro, Pacific Island Bistro and Caffé Coco), the delightful walk along the shore to the outstanding facilities offered at neighboring Lydgate State Park, and the proximity of Kauai’s diverse attractions on both North and South shores. The gracious accommodations exceeded our expectations – the elegant furnishings and linens, up-to-date appliances and internet, and very comfortable bed made our stay most enjoyable, as did the ease of check-in and reservations. We had an excellent experience with this rental, and recommend it without hesitation. Sara Lee Lewis, Wolfville, Nova Scotia, Canada. The Condo was exactly as portrayed on the web site. Very spacious, clean, with the most gorgeous view, everything was supplied in the kitchen, right down to an ice-cream scoop. The booking process was very simple and the agents in Kauai Resort Rentals were always very helpful, courteous and certainly went out of their way to make the booking process go smoothly. By far, it is the nicest vacation accommodation we have stayed in and is exactly as portrayed in your advertisement..........and I have used the VRBO for many of our vacations abroad. We would certainly recommend your condo to anyone and definitely hope to return ourselves. We just got back from our trip in January, and the condo was everything it claimed to be! The beach view is perfect from the patio, and the beach itself was wonderful! We went out every morning to watch the sunrise, walk the beach and watch the whales! There is a small tide pool on the beach that captured my attention every day, different marine life each morning to explore. 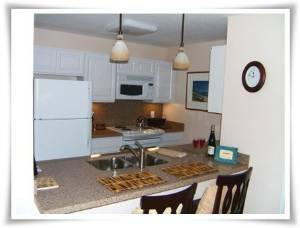 The condo is in a very easy, convenient location, it's clean and provides what you need to cook, even had a washer/dryer to dry those beach towels they provided for us! The staff in town were very accomodating! Wife & I spent our honeymoon in G6 12/06/08 to 12/20/08 and were very happy with the unit. Unit was exactly like the pictures & there were no surprises. Beautiful condo - we really enjoyed our time there & look forward to returning again & again. 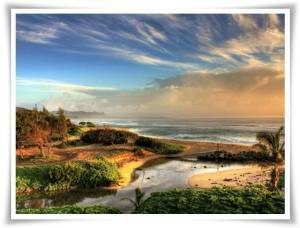 Kauai is a great island & this a great place to enjoy. We used the pool & hot tub several times & they were very nice. This was the first time we rented a condo & could not have been happier. Very nice unit & we highly recommend it. Great location only minutes from the airport. Nice beach location. Beach outside the unit was great - like having your own private beach. My husband and I stayed in this condo from 12/27/08-1/2/09, and we fell in love with the condo and the location. The condo is in a very central location, and it was great to be equidistant to the west and north sides of the island since we were exploring it for the first time. My first impression was that the condo was very clean and that it had a great ocean view from the lanai. I was very pleased that the photos and the description of the condo were accurate. We really felt at home here--the condo was so comfortable and had every amenity necessary. The king size bed was cozy and comfortable. All the appliances in the kitchen worked well, and we found cooking enjoyable since we had all the pots, plates, and glasses we needed. We also spent some time having drinks at the Hilton resort which is just a short 2 minute walk from the condo. It was nice that we could grab a drink or dinner there if we didn't want to head out. I also want to mention that the condo owner responded to all my emailed questions in a very timely manner, which I really appreciated. My husband and I highly recommend this condo, and we'll definitely be back! I can’t even express to you in words what a wonderful time we had in Kauai! The condo could not have been any nicer . . . . it provided such a comfortable environment for us. We would not hesitate to stay with you again if we are fortunate enough to come back. FYI: We actually went to a time share presentation at the Marriott and decided we would MUCH prefer to stay where we were. My husband has already asked to go back for his 60th birthday (2 years from now). The Condo was an incredible place all around! The location was great, the views were priceless, and the interior of the condo was first class. Will do my best to be back as much as possible! Incredible honeymoon!!! One week in paradise. I won't go in to the extensive remodel the owner did. You can check out all the information from VRBO or the owners site. All I will say is we have traveled to the islands for years and Kauai Beach Villas G-6 was by far the best condo we have stayed in regardless of the price. The view for sunrise or sunset was spectacular. The location of the condo was great. It sure cut down on the time for our site seeing trips. The owners suggestions and extras page gave us many different suggestions of places to visit. Every morning we took a 3 mile hike roundtrip down the beach (which was very clean). We only saw an occassional swimmer, surfer, or someone fishing from the shore. 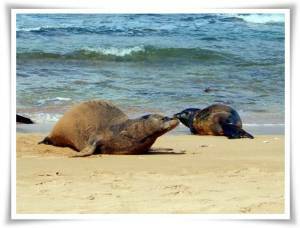 There were a couple of monk seals right on the beach one morning. Did I mension the view? The different blues seen from the lania were really special. It was breazy while we were there but the angle the lania sits you are pretty well protected. We were able to cook out at the BBQ pit twice. It was a popular spot. One other note. We are from South Arizona and had to have a unit with a/c. We never turned it on because of the wonderful sea breeze through the condo. However the roosters were a pain at 5:00am but we were awake anyway. I would HIGHLY RECCOMMEND this condo to anyone. We have already rebooked for 2 weeks next year. I can't wait to go back. This was the best value ever and the cleanest condo we have ever stayed in! The condo is correctly named, Beach View, as the view is wonderful. Additionally the balcony is sheltered from the wind blowing off of the ocean. Everything in the condo was first rate. I will return. What a great condo!! Comfortable furniture and loaded kitchen was great for the little cooking we did. Perfect location with shopping and resturants right at hand. The beach was lovely and the view from the patio was beautiful. furniture. A great location to be in, all the island is easy to get to from here. Beautiful view from the patio, enjoyed breakfast every morning there.Great beach with hardly any one on it. We have been to the islands over 25 times and this is one of the best condos we have stayed in. We give it an A+++. PS-the rental office is nice to work with. Very nice, recently renovated unit. Well equipped, beautiful, partial ocean view. Great location. Would definitely recommend! we stayed 2 weeks in G-6. it was newly redone and very clean. new firniture and up-graded lanai furniture was extra nice, as we spent a lot of time on the lanai. great location, easy access to the rest of the island. ideal for airport, making it so you can stay right up to the end. great beach with hardly any one using it. would reccommend this unit. We stayed in G-6 for 7 days the first part of December 2007. I would definitely recommend staying here. There is ample information already about the remodel on the owner’s website so I won't go into that. Yes, the remodel results are great. Contact the owner directly for all the info you might need as he is very helpful. The actual renting is done through Kauai Vacation Rentals & Real Estate where there will be a non-refundable $110 cleaning fee so no need to wash the linens before departure. The AC set a 72 in the bedroom was very nice if your used to sleeping at cooler than Hawaii temperatures. Also has a washer and dryer, TV with VCR/DVD, and high speed cable internet. The entire grounds of the complex, pool, etc. are well kept and taken care of. The patio looks out north down the coast which is very picturesque. The location is central for dining, shopping and exploring. It is a few miles north of the airport along Hwy 56 sharing the stretch of beach with the Hilton. Lihue is 5 miles south and Wailua/Kapaa are less than 10 miles north. There were maybe a handful of people on the beautiful beach (idyllic) that stretched for miles at any given time. The water/currents here are dangerous so if you want to swim, travel a few miles north to Lygate park. The patio does look out to a dirt track along side the beach. We were at the condo maybe half the week and during that time there were maybe 4 hours total of motor escapades. It looks like a track where locals stop by now and then to run their dirt bikes and three wheelers and not a scheduled big event racing thing. When someone did show up, there were maybe 1-2 people. Not a big deal. You can easily walk south down the beach but that side is more rocky than going north. The beach going north has a larger expanse of sand and visual appeal. However, to go north on the beach you must traverse a shallow “stream / pool” a few yards wide. The water was not even moving and depending on the tide was up to your knees. Only a problem if you’re handicap. We stayed in unit G-6 which has been recently remodeled. The condo is nicely decorated and very comfortable. This unit is on the top floor of a three story oceanfront building. The unit is actually located on the side of the building, with a great view of the coast. We think that this is actually a little better than the units that face directly out towards the ocean, as you got a great view of the coast plus protection from the trade winds. Unit completely remodeled. Professional Interior Designer Services. and Sile Stone Quartz Countertops and Décor. Ditto for Living Room and Dining Area. Large Sectional Sofa, cozy Recliner. Designer Touches throughout. 16” Textured (Sand Toned) Ceramic Tile all throughout unit. Newly painted throughout with soft tint beige walls with white trim and ceilings. Koa Framed Ocean Photography throughout unit. Completely furnished ready to move in or rent out. Currently this condo is being remodeled and should be completed May 1st. All new tile and paint throughout, custom cabinets, all new appliances, new bathroom, original artwork, and granite countertops. New condo pictures will be updated on the website in May.